N-STORM | Super-Resolution Microscopes | Products | Nikon Instruments Inc.
Tenfold increased resolution in x, y and z.
STochastic Optical Reconstruction Microscopy (STORM) reconstructs a super-resolution fluorescence image by combining precise localization information for individual fluorophores in complex fluorescent specimens. 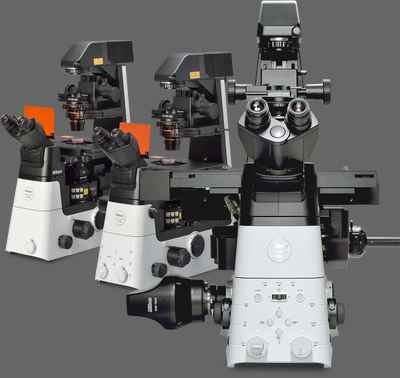 N-STORM takes advantage of Nikon's powerful Ti2-E inverted microscope and applies high-accuracy, multi-color localization and reconstruction in three dimensions (xyz) to enable super-resolution imaging at tenfold the resolution of conventional light microscopes (up to approximately 20 nm in xy). This powerful technology enables the visualization of molecular interactions at the nanoscopic level, opening up new worlds of scientific understanding. In addition to lateral super-resolution, N-STORM utilizes proprietary methods to achieve a tenfold enhancement in axial resolution over conventional light microscopes and provide nanoscale information in 3D. The 3D-Stack function allows multiple 3D STORM images from different Z positions to be captured and stitched into one image to create thicker STORM images. N-STORM utilizes high accuracy localization information for thousands of individual fluorophores present in a field of view to create breathtaking "super-resolution" images, exhibiting spatial resolution that is 10 times greater than conventional optical microscopes. Newly developed optics and illumination systems, optimized for sCMOS technology, have increased image acquisition speeds by up to 10 times. With acquisition times reduced from minutes to seconds*, dynamic events in live specimens can now be captured with molecular level resolution. Multi-color super-resolution imaging can be carried out using both activator-reporter pairs for sequential activation imaging and activator-free labels for continuous activation imaging. This flexibility allows users to easily gain critical insights into the localization and interaction properties of multiple proteins at the molecular level. Newly developed excitation optics and improved image acquisition rates provide increased molecule localization density, resulting in clearer images of macromolecular structures. Super-resolution image quality is significantly improved in the same imaging time. New intermediate zoom lenses in the imaging system have been developed and optimized for a wide field of view. The wide-view mode achieves 80 μm x 80 μm, a 4-fold increase in imaging area compared to previous models. 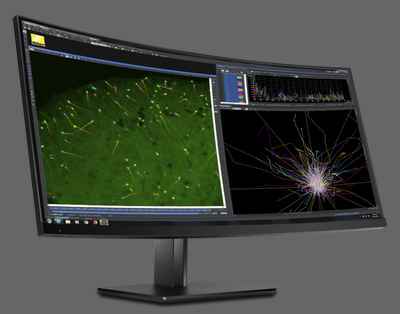 The N-STORM can be simultaneously combined with a confocal microscope such as the A1+. A desired location in a sample can be specified in a low-magnification/large FOV confocal image and acquired in super-resolution by simply switching the imaging method. 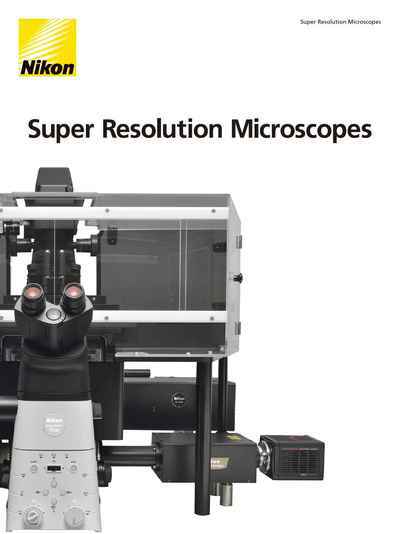 Combining a confocal microscope with a super-resolution system can provide a method for gaining larger contextual views of the super-resolution information. Silicone immersion objectives use high viscosity silicone oil with a refractive index close to that of live cells as an immersion liquid. Because of this improved refractive index compatibility, these objectives can provide improved photon collection capability and resolution when performing super-resolution imaging deeper into the specimen. They exhibit superior chromatic aberration correction and high transmittance over a broad range of wavelengths. These objectives provide the high numerical apertures required for N-STORM imaging. The HP objectives are compatible with the ultrahigh power lasers required for inducing rapid photoswitching of fluorophores. They provide improved axial chromatic aberration correction to achieve the highest level of precision in localization and image alignment for 3D multi-color STORM imaging. 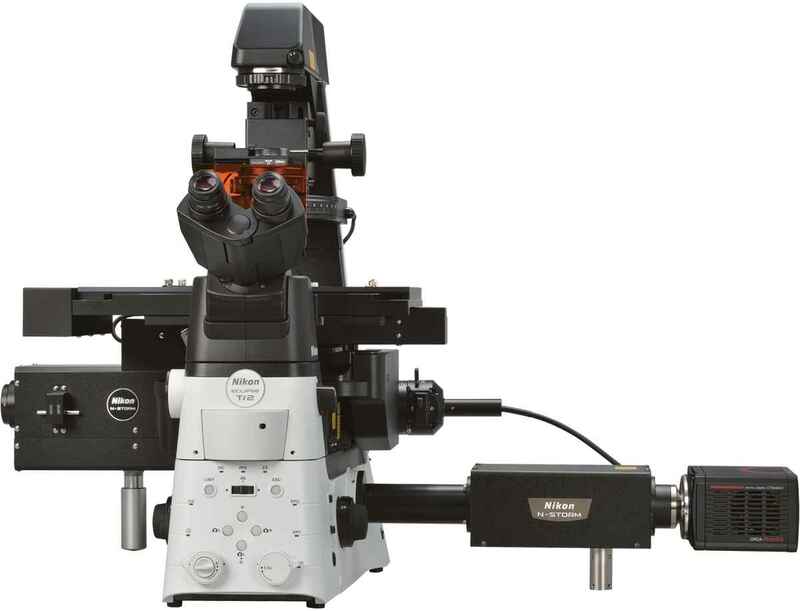 The AC-type objectives that support the Auto Correction Collar of the Ti2-E microscope allow precise and easy adjustment of the correction collar.